Worn teeth can be sensitive and allow bacteria to enter the pulp causing an infection. Hard objects like cow hooves, bones, nylon bones, antlers and even softer abrasive objects like tennis balls can result in loss of tooth structure. 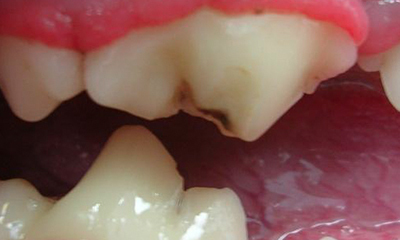 Dark brown spots may appear on worn teeth and overtime, bacteria will penetrate to the pulp and cause infection. Abrasive tooth wear of the premolar. 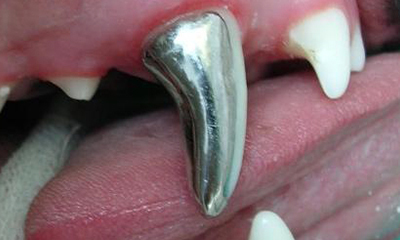 Abrasive tooth wear of canine teeth. 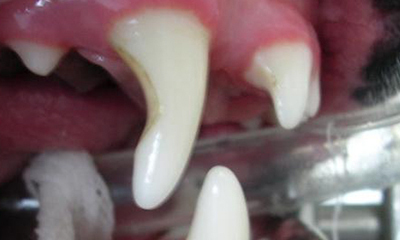 Abrasive wear weakening the canine tooth. Crown fabricated to protect the tooth. ¾ crown protecting the tooth. 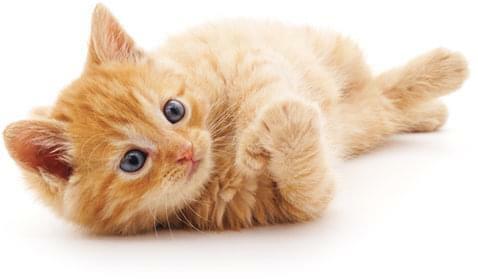 Schedule an appointment today to have your pet evaluated for any worn tooth. 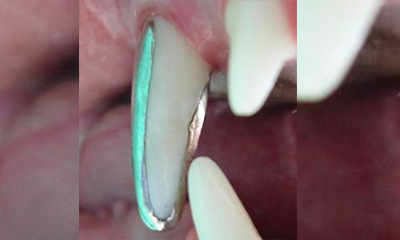 The abnormal process of teeth wearing rapidly is known as dental attrition or abrasion. Hard objects like cow hooves, bones, nylon bones, antlers and even softer abrasive objects like tennis balls can result in loss of tooth structure. Fortunately, the dental pulp can respond to gradual wear by laying down tertiary dentin, which is visible as a dark brown spot on the affected tooth. The dark brown spot is an irregular hard substance that is somewhat porous and in some cases allow bacteria to penetrate to the pulp. 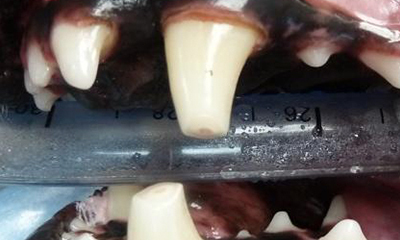 These teeth need an evaluation under anesthesia using a periodontal explorer and dental X-rays. Teeth found to be normal are recorded in the patient’s medical record and re-evaluated in 12 months. Affected or diseased teeth (root resorption, root infection) need to be treated with root canal or extraction therapy. Some pets benefit from metal crown therapy if the offending object (such as cage/crate/fence chewing, rocks) cannot be removed from their surroundings.